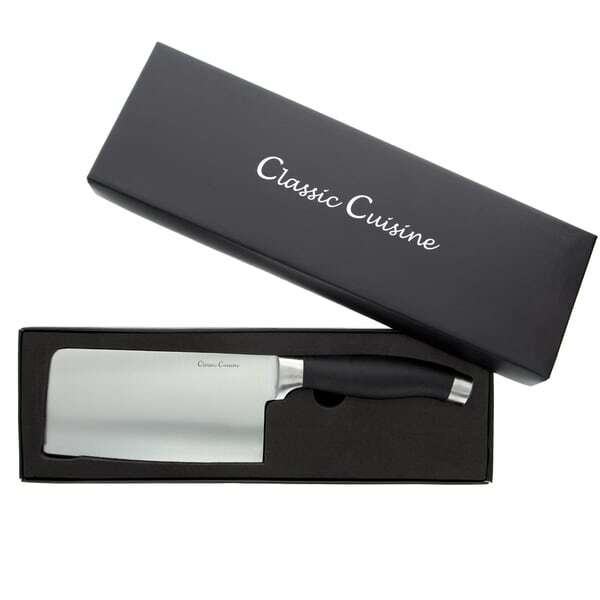 The Classic Cuisine 6.5 inch Chopper Cleaver is perfect for the professional chef, culinary student and the home cook. The Stainless Steel Cleaver Chopper comes in an attractive box complete with a molded thick foam insert for protection and storage. Our ergonomically friendly handle has a rubber, non-slip comfort grip cover. This cleaver chopper also makes a great gift for any cook or professional chef. PROFESSIONAL CHEF QUALITY - Classic Cuisine's 6.5 inch cleaver is intended for long lasting use and is constructed using high quality material. The hand forged stainless steel knife with ergonomic non-slip comfort grip handle is designed for hours of use without hand stiffness or discomfort. EASY TO CARE FOR AND STORE Just run under warm water and wipe clean. Store in the provided molded foam insert or in a knife block. Do not leave your knives loose in a drawer or let them lay in standing water. GREAT GIFT - Any professional chef, culinary student or home cook will love this Cleaver Chopper. A great gift idea for weddings, house warmings, graduation, to add to a registry list or any occasion. This Cleaver Chopper can be laser engraved. SATISFACTION GUARANTEED Classic Cuisine is committed to providing consumers with the absolute best price and value on our entire line of products. NOTE: This is an exclusive product of Classic Cuisine and ONLY 6.5 inch Chopper Cleavers by Classic are GUARANTEED to be genuine. This cleaver is an excellent, heavy duty kitchen tool! I love how solid it feels in my hand and it was very efficient in cutting my BBQ pork ribs. It was shipped quickly and I use the box that it came in as a storage box for the cleaver. I highly recommend the product - you won't be disappointed! i love the product everything i need.